A man (Fabien Lucciarini) sits down on his hotel bed with a book. He cleans his glasses, inspects his glass of scotch and proceeds to read. He is interrupted by the gentle swoosh of a letter being slid under his door. He closes the book and opens the letter. It contains a photo of an unsuspecting younger woman (Mouna Bouchouk). On the back is her name, a “classified level 5” code and a three hour timeframe. So goes the set up to Simeon Lumgair’s 10-minute London-set thriller, ÉLUDER (translated as “to evade”). It’s a stylish piece of work, from the classy Hitchcockian title animation to the soft focus glow of the lighting. Lumgair’s camera moves with confidence in both the compact hotel interiors and the sleek exteriors. London looks fabulous and Vijey Anant (cinematographer) handles the low light levels well. The production value is high throughout, and Lumgair selects five effective classical pieces for the film’s score. While they provide real dramatic purpose, their use can come across as a tad heavy, at times. Likewise, the story twists and turns nicely, without ever really offering too many surprises. 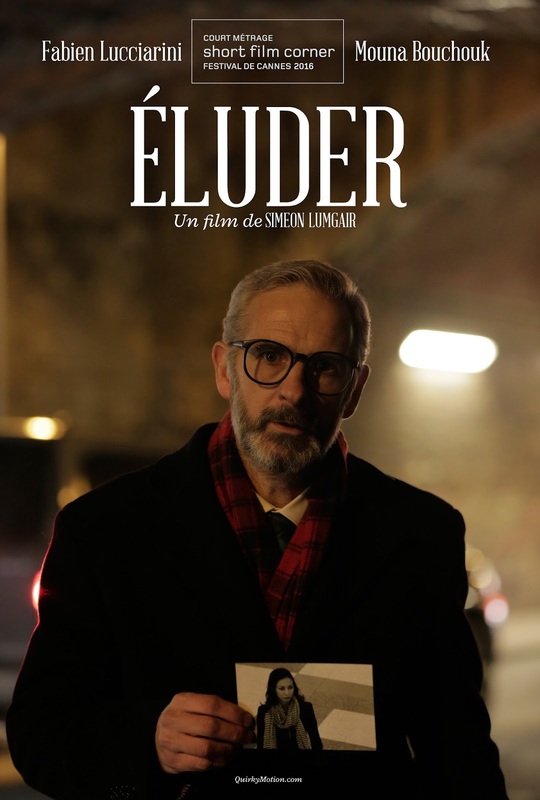 On this basis, ÉLUDER’s inclusion in the Cannes Film Festival’s Short Film Corner seems deserved. And even if the thriller plotting does nothing for you, the film is a real delight to look at. Screener and image courtesy of Simeon Lumgair and Quirky Motion. If you have a short film you’d like reviewing, don’t hesitate to contact me: benedict.seal@gmail.com or via Twitter.